When it comes to goals, I’m addicted. I’ve been setting goals for years and have accomplished a lot because of the fact. I’ve also made tons (and then tons more) of goal setting mistakes and have learned what I need to do to get past them. I do this all the time. (Okay, I used to do this all the time. I’ve changed my ways this last half of the year.) And when I say biting off more than you can chew I don’t mean being unrealistic – we’ll get to that in a minute. Instead, I mean that you overcommit yourself to more than you can handle. For instance, when I was building up my freelance writing business I wanted to make money fast so that I could quit my day job. I started out at a fairly low rate which meant I had to write twenty blog posts per week to make the money I needed. I wanted to reach my goal so bad that I was killing myself trying to keep up with it. I’d literally stay up until four in the morning working on my freelance business after coming home from my day job and taking care of my girls. I got burnt out fast. Now that I’ve went down to a very manageable amount of clients I’ve found that my love of writing has come back, plus I’m making more money! Instead of killing yourself to meet a goal reassess the situation. What can you do to get similar results without adding a ton of stress into your life? Don’t add that stress! Goals are meant to help you enhance your life, not make your life miserable. My savings goals are sometimes way too unrealistic. I’ll set a monstrous goal of saving for a large purchase (like an investment property) and then fall short of my goal. You don’t want to make your goals too unrealistic. That’s because success = success and failure = more failure. When you achieve a goal you get a high off of it. And because you want to feel that feeling again you’re more likely to replicate your success. When you fail at your goal your brain is not giving you those positive vibes and you’re much less likely to go for it again. Do you read a lot of blogs? If so, then you’ve probably read your fair share of goal posts. As a blogger I love sharing my goals because it forces me to actually write them out and gives me a sense of accountability. The bad part is that reading other peoples goals can start to warp your own vision. You are uniquely you so subconsciously taking on someone else’s goals is a horrible thing. I often do this with my income goals. Yes, I do want to make more money but I’m also happy with where I’m at. When I read other peoples income goals/reports I’ll put pressure on myself to be like they are, when the truth is I don’t need $10k a month to be happy. I’m pretty happy at $30k a year. If you feel like other people might be having too much of an influence on your own personal goals then stop listening to them (or in my case, reading them.) I’ve went through spells where I’ve completely had to stop reading other blogs just so I could find my own voice again. This where most people go wrong – not making their goals a priority! I think the number one reason for this is that they’re not setting the right goals to begin with. Your goals should be set around your personal priorities. They should be something that light you up inside. If you’re setting goals that are consistent with the life you want to create then it will be pretty hard not to think of your goals all the time. If your goals aren’t a priority you need to change those goals. You are allowed to change your mind. Your goals are not set in stone! If the goals you set a year ago are no longer appealing to you, then change them. Your goals are meant to help you have a better life. Don’t be stubborn. If you need to change your goals then just do it! 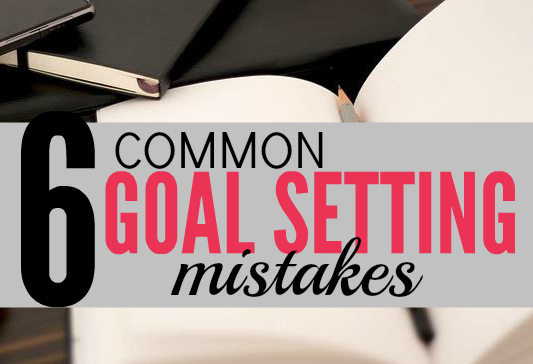 Another common goal setting mistake is not picking yourself up when you fall of track. We’re all human, none of us are perfect and at point or another we’re going to get sidetracked. It happens. Dust yourself off and stand right back up. If you have no motivation to do that then you might want to change your goals or make them more realistic so that you start to get addicted to your own success! 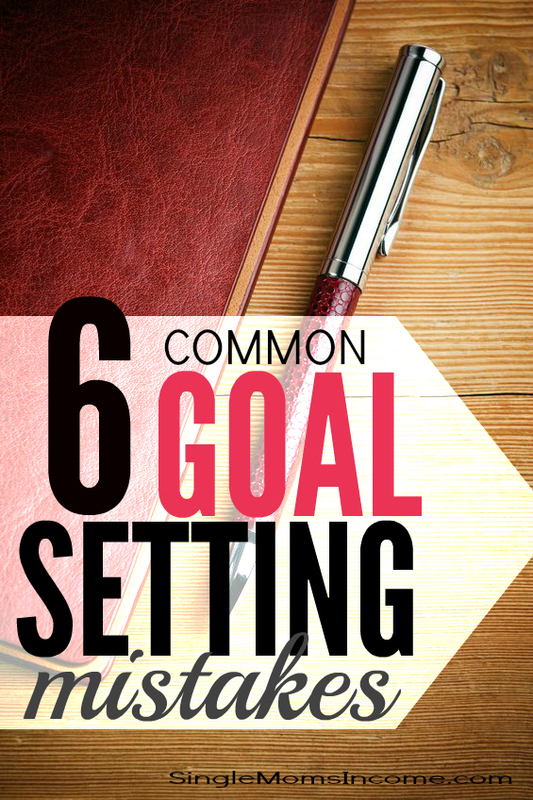 Setting the right goals will change your life for the better. Be persistent, refuse to fail, jump back on track when you fall off, and always be analyzing. Setting goals has been a huge part of my transformation over the past few years and I don’t know where I’d be if I hadn’t taken the time to make a plan for my life and then act out my plan. I want the same for you. Go build an awesome life. You can do it! What’s your biggest goal setting mistake? I love the point of adopting other people goals as yours. I really believe that people will look at others and think thats what they should be doing, when your goals should be tailored to your own life needs and capabilities. Everyone is travelling on a unique path so therefore their goals should also be unique. Yes it is sooo hard not to do. A lot of it is in our own heads. We feel the pressure to accomplish what others have accomplished just to say we did it, rather than going for something that matters to us. I really try to be aware of making self comparisons and stop myself when I start to do it. Your timing in writing this couldn’t have been better! We’re finalizing our 2015 goals right now, and this is exactly what we needed! I especially like the point about adopting someone else’s goals. While I love reading goals posts it can be so hard not to compare yourself to others. However, when I found someone whose in a similar situation as me, I’m all over it! I agree finding the right goals is important. If it’s a goal I’m actually interested in, then it’s easy for me to do what it takes to achieve it. When I take on other people’s goals, I’m much more likely to fail because they aren’t something I’m really interested in. Yeah sometimes I set goals for myself that I have no interest in actually achieving and then a week later I have to revise. It’s so important to set the right goals!